After years of seeing UK bloggers rave about Odylique products, I was ecstatic to learn this fall that the company was launching in North America. 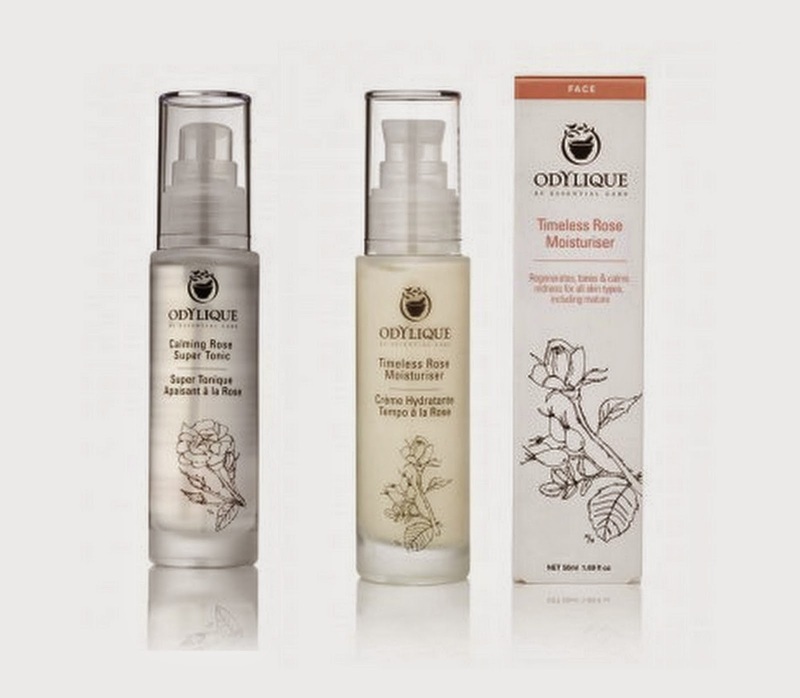 Odylique - formerly called Essential Care - is an award-winning, certified organic, 100% natural skin and hair care line that's designed to be compatible with the most sensitive skin. 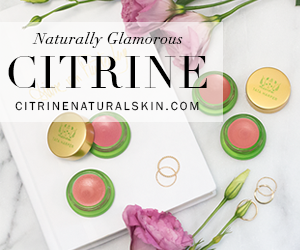 Created by a mother-daughter team, the line is based on organic herbs, plant oils, and natural active ingredients and is free of parabens, petrochemicals, sulphates, and artificial additives, as well as common allergens like tree nuts, soy, wheat, and dairy. 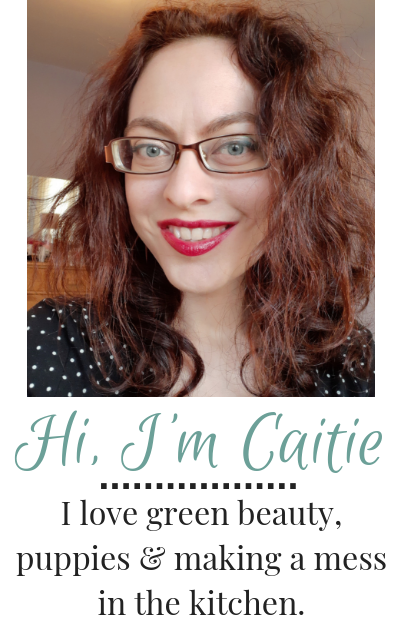 I've been trying out a few products from the line and I've also got a fantastic giveaway from Odylique, so make sure you read to the bottom and enter! 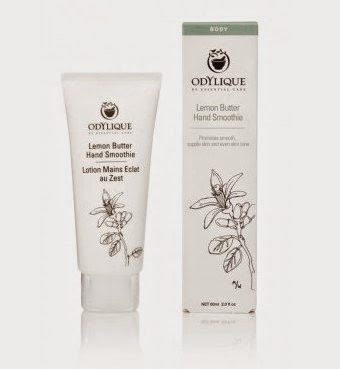 My favorite of what I tried, the Hand Smoothie is a recent addition to Odylique's line and has a great lightweight feel and a cheery yellow color from sea buckthorn extract and avocado oil. 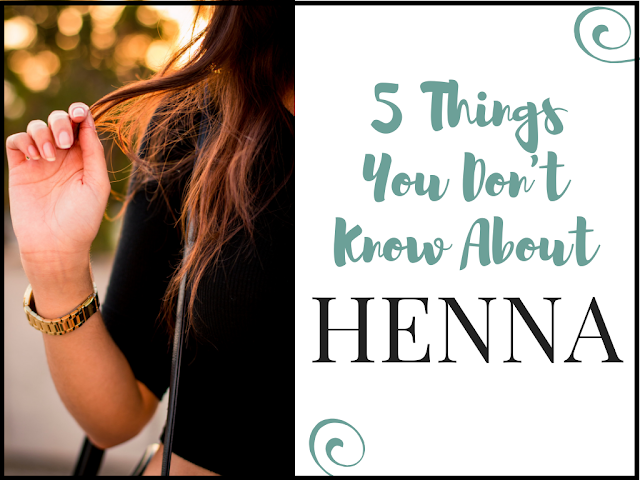 Other great ingredients include aloe vera, cocoa butter, sunflower and coconut oils, and calendula. It feels very nourishing on the skin, but also absorbs quickly, so you can continue on with your day without having to wait for your hand cream to sink in before you can touch anything. The scent is a mix of zesty lemon and lemongrass with sweet, floral geranium. The Calming Rose Super Tonic, a blend of rosewater, rose essential oil, and calendula extract, works very well at calming the skin and reducing redness. The glass bottle is elegant and I appreciate that it disperses a good, even mist. The Timeless Rose Moisturizer is a lightweight lotion that includes anti-aging sea buckthorn and rosehip extracts. It does contain coconut oil, but I haven't had any issues. The rose scents are a little overpowering for me - you guys know I'm not a big fan - but if you like rose, I think you would get along well with either of these products. Odylique is generously giving away their brand new Selection Box to two of you lovely readers! 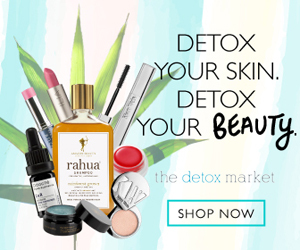 The box includes trial sizes of seven of Odylique's most popular products: the Coconut Cleanser, Calming Rose Super Tonic, Timeless Rose Moisturizer, Superfruit Concentrate, Coconut Candy Scrub, Gentle Herb Shampoo, and Ultra Rich Balm. If you haven't tried Odylique yet, this looks like a fantastic way to get a feel for the line. The giveaway is open internationally, and only requirement is to leave a comment telling us which product in the box you'd be most excited to try. You can get extra entries by following me and Odylique on social media and tweeting about the giveaway. Fill in the Rafflecopter widget to make sure all your entries are counted! I'm torn between the coconut cleanser and the gentle herb shampoo. I love herbal scents more than flowery ones, so it sounds divine. Aghhh I've been having severe breakouts and the Ultra Rich Balm sounds like it would soothe my raw skin like a dream. 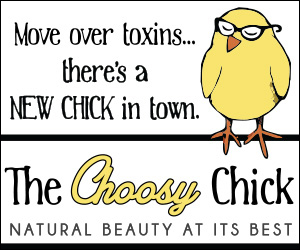 I'm so excited to give this brand a try! I've heard such great things about them, especially the Superfruit Concentrate, so I'd love to try that. I definitely want - no, make that *need* to try the Hand Smoothie! Superfruit concentrate...I have never tried Odylique or heard about! Thank you! I would love to try the Coconut Candy Scrub. I would love to try the hand lotion. My hands get destroyed from having to use hand sanitizer all the time at work, and I'm always on the lookout for something new that might help them. I would like to try the super fruit concentrate. I'd love to try the Ultra Rich Balm. My skin is so dry at this time of year. The Lemon Butter hand smoothie! What a great giveaway! :) I haven't tried any of the products yet so any of them would be super, especially the Coconut Cleanser and the Gentle Herb Shampoo. I'd love to try the Superfruit Concentrate! I really want to try the coconut cleanser! I absolutely love the rose moisturiser, its my favourite and must have all year round! Lemon Butter Hand Smoothie sounds great! I would love to try the Gentle Herb Shampoo - it sounds lovely. I have heard some great reviews about the shampoo. I hope the coconut candy scrub smells as good as it sounds! wow, such a great giveaway! i thinks i'm most excited about The Timeless Rose Moisturizer, firstly because i just love love rose scent and my skin have been hit really hard this winter do i'd appriciate the extra hydration! The Calming Rose Super Tonic i would really need to try it! gentle herb shampoo for sure! I would like to try the Calming Rose Super Tonic. I have always had a red face at times and now that I have started to get hot lashes it is even worse. I would like anything to help reduce the appearance. would love to try the gentle herb shampoo! I would try for my face the Calming Rose Super Tonic! The hand smoothie sounds good enough to eat. I'd love to try Ultra Rich Balm. Superfruit Concentrate sounds great as well. Thank you for this lovely giveaway. I would love to try the Calming Rose Super Tonic, I think it would work wonders for my skin. Happy New Year! Amazing giveaway! I'm not entering but the hand smoothie is sooooo lovely! With a name like Rose, I'd like their The Timeless Rose Moisturizer! I would love to try the Coconut Cleanser, they say amazing things about coconut, so I am really curious to try it!